This afternoon I received a SMS on my cell phone inviting me to check the hours of the Customer Service office and gave me the price of the repair of my camera that drop last Tuesday. Unbelievable, but they did what they said, the price is 30% below the estimate, and I have it before the week long they say I was going to have my toy back. I know that for some of you out there, if it’s broken buy a new one. What about the sentimental value? My friend was the witness of the best I saw in the last 4 years, and I had to try to fix it when possible. So we back together, my friend with a new optical and me with a new visual. Let’s start again on the right click. PG18: This post should not been read by sensitive soul. On my way back from giving back my camera to the Canon customer service (yeah, my camera died on me) and seeing an afternoon movie at VivoCity around 7:00 PM (yeah, one of the advantages of being unemployed), I was stopped by the largest demonstration I have seen so far in Singapore. On the side of the busiest avenue in town, some barricades were risen up to prevent traffic from going over a small and tiny human walking demonstration with strange outfit and music instruments. I learnt later on that Thaipusam was going on. Thousand of people were walking along the road, singing and dancing, accompanying and supporting fellow Indians attached to metal instrument during their walk. On a closer look, I realized that they were all actually attached physically, by their own bare skin to semicircular heavy weight metal structures while walking bare foot on the hot asphalt. Most of them had their cheeks transpierced from on side to the other by a long and sharp needle. Some, more tough I presume, had their tongue also taken from top to bottom by another one. None of the braves could talk, or complain during their walk. Drinking was difficult. A few did not have any heavy metallic structure on them, but all of them had hooks on their bare back skin with lemons attached to them for making the catch stronger and heavier. The crow around the brave men was chanting and dancing helping them to swallow the physical pain they were enduring. I saw a man almost passing out by fatigue, pain or alcohol who knows. When encouraged and cheered the bravest of the brave were spinning on themselves making the entire structure pooling the skin more intensely. No blood was on the street, but pure pain was visible on each and every faces I looked at. It was extremely impressive and intense to see a cohort of suffer walking by, supported by family member or other friends in the middle of Singapore. The singing, the music, the colorful Sari, the alcohol and other drugs were helping some fellow human carrying a painful instrument from one side of the city to the other in the name of Lord Murudan or Ganesha. I quickly went back home and crawl for information on the internet on what was happening in front of my eyes few hours before and what I discover make me scared even more about my own condition. The preparation of kavadis (semicircular metal and wood structures) starts approximately 7PM on the eve of Thaipusam at Sri Srinivasa Perumal Temple in Singapore. 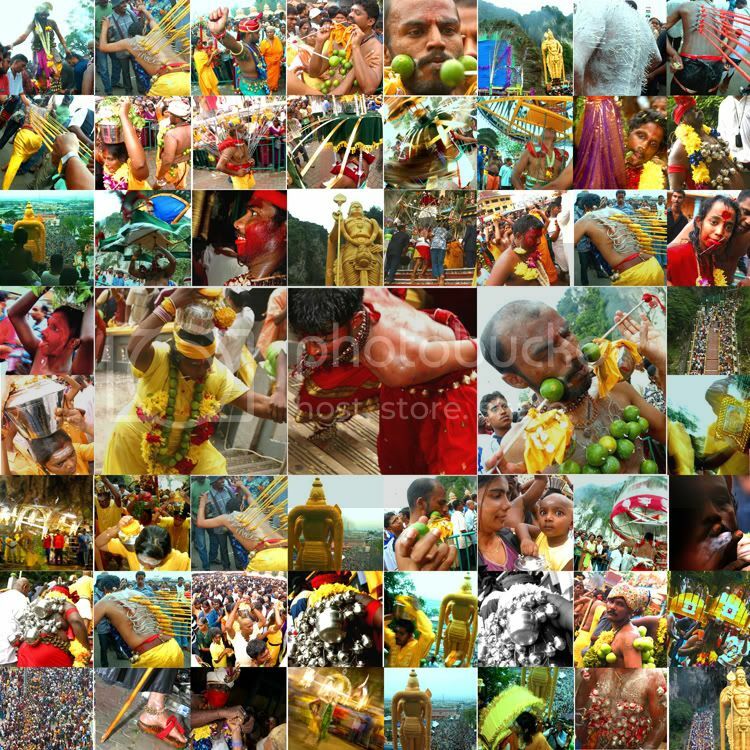 Devotees of Lord Murudan (also known as Lord Subramamiam) believe that Thaipusam was given the vel (divine spear) by his mother Parvati to defeat Surapadman, a demonic character. At the beginning, rituals at the Sri Srinivasa Perumal Temple consist of taking baths and making offerings to Lord Ganesha (the remover of Obstacles) before the walk of faith. Lord Murugan is worshipped as the granter of wishes. For a favor asked or received, devotees fulfill their vows, by carrying pots of milk on their heads or kavadis in a 4.5 kilometer from Sri Srinivasa Perumal Temple on Serangoon Road to Sri Thendayuthapani on Tank Road. That's when I became scared. To all of you to whom I send my best wishes for the New Year, I will have to retract what I said to you, because if you actually ending up have a great year, full of fun and surprises, adventures and happiness, I will have, for the grant of my wish be part of the ceremony next year. Sorry, but I am not going to do Thaipusam next year. Living in a share apartment is sometimes refreshing, sometimes interesting but never boring. The short term lease 3 bedrooms apartment is a place of In-and-out by it simple definition. It happens that your Monday’s roommate will not be there the next Sunday and will keep on moving to his or her next travel destination. My long term hotel stay is a place for wanabe travelers or semi retired corporate lifer. Notwithstanding it seems very undersized but with a 3 months under my belly I am the oldest inhabitant in the flat, from my recollection. I had people from South Africa, Brazil, England, Hong Kong and even Singapore sharing the bathroom or the kitchen with me, but the last roommate that decide to stay for sometime with me is different from the others ones. His name is Paul, and we just meet a couple of days ago. 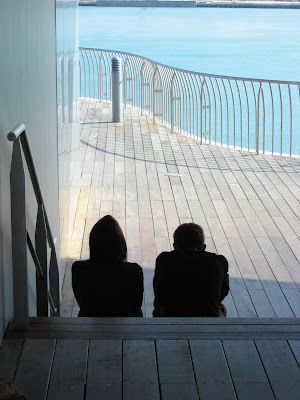 We did not had a chance to fully introduce ourselves but I am sure we would had a great exchange if we had done it. Paul is a Nighter, and I am these day a Dayter. I get up when he comes back from a night full of adventure and he sleeps all day long, and I do the exact opposite, although I am a bit jealous. He is a dreamer and usually lives on the ceiling, and I am proud to tag myself as a fully grounded person. He is small, and I am still wearing proudly my 10 extra pounds that I carried over 3 continents from past year adventure. He is green, and I am becoming wiser thankfully to my over emphasized recently white hair. Anyway, we are very different and at the same have a unique chance to know from each others, sharing the same head quarter. Until this morning, when after a night of partying I sure of, I found Paul in my cereals box. That was the limit for me, I can’t take it anymore. I do not like when people stealing food from their roommates. Do I have to keep EVERYTHING in the fridge with my name on it? I will have to talk to the owner about that, and I am sure that Paul the Gecko is not paying rent on top of it. In 2006, the number of tourists visiting Singapore reached a record number of 9.7 million. I am sure that in 2007 the 10 million hurdle was easily jumped over. What do all this visitor all do in Singapore? You already know that, they shop, and they eat, and they shop, and then shop again, and finally go to bed, because the next day they shop, and they eat, and they shop, and then shop again, and finally they go back home. You have thousands of places to shop in the Mall-Town (… no music involved there). You can find the mall you want, at the time you prefer, and with the friends you want. Orchard Road is just a non stop succession of malls linked with air-conditioned underground to avoid the heat outside just there for you to shop all day long. Most of the malls close at 9PM. But some never close (Orchard Pacific) and can entertained the youngest of the island all night long. Some called it even the Teenager Mall, in reference to the average age of it visitors, and not it size. 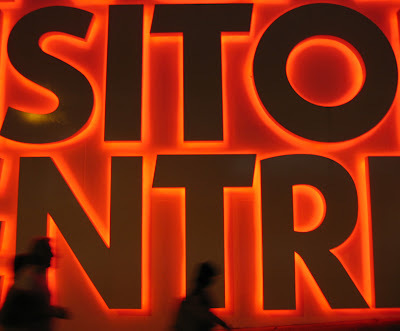 Along the way of the shopping mall street, you can find many Singapore Visitor Center, with thousand of maps, flyers and other marketable prospectus to point any visitor from any country in the world to the right shopping direction. You can also relax in a feet massage chair while watching some videos on how to shop in Singapore. I really don’t know how many Singapore Visitor Center you have in the city, but all are pretty convenient, huge, air conditioned and comfortable. I would stay the entire afternoon there if they had free coffee, and not having people who keep asking you if you want to see a show, go to the zoo, or buy something in particular. Shopping is a life experience in Singapore as good as eating, breathing or sleeping. Beware VISITOR, if you come to Singapore you are going to be park in Center, and be ready to shop, and ship your sh*t.
The fastest way from London to Singapore is definitely by the air, but the most interesting one is certainly the longest one, using an incredible amount of time and a few extra dollars to cross the entire European and Asian continents by train. I started dreaming about this long journey by reading Seat61, a compilation of information about all the trains in the world, and I was not sure about the feasibility of the journey. I did some research, and yes you can do this London-Singapore by train and bus. Do I have to mention it? Ok then, it's an hourly departure, from London Waterloo, arriving in Paris Gare du Nord in less than 3 hours, from about £44 one-way in 2 nd class compartment. Travel from Paris to Moscow by direct air-conditioned sleeping-car of the Russian Railways, arriving in Moscow two nights later. Departure are Tue, Thu, Sun in the winter time and daily, (except Sat), during the summer time. The 45 hours trip in 2nd class compartment ticket costs 330 € one way. Two trains a week, 6 nights, from about $350 one-way in 4-bed sleeper.There are two direct trains a week from Moscow to Beijing (Peking), one via Mongolia with Chinese rolling stock and one via Manchuria with Russian rolling stock.The route via Mongolia is arguably the most interesting one. The weekly train leaves Moscow every Tuesday night and takes 6 days to eat the 7,621 km (4,735 mile) journey. This train crosses Siberia, cuts across Mongolia and the Gobi desert and then finally enters China. This train has deluxe 2-berth compartments, 1st class 4-berth compartments & 2nd class 4-berth compartments. Fares start at around $350 (£180) one-way in 2nd class 4-berth or $500 (£260) in 1st class 2-berth. The route via Manchuria is a weekly train leaves Moscow on Friday nights and is taking just over six days to cover the 8,986km (5,623 miles). There are 2-berth 1st class compartments and 4-berth 2nd class compartments. Prices are similar to the Chinese train. There is a safe and comfortable twice-weekly 45-hours average train service between Beijing & Hanoi. A Chinese express train with 4-berth soft class sleepers and restaurant car runs from Beijing to Dong Dang on the Vietnamese frontier. Then you pass through customs and board a connecting Vietnamese train for the final leap to Hanoi. The fare is the equivalent of 143 Swiss francs (£71 or $120 or 1,939,000 Vietnamese dong) if you buy your ticket at the ticket office. Vietnamese trains are the ideal way for independent travelers to get around. The trains are safe, comfortable and inexpensive. The train journey is also an experience in itself, and become an integral part of your visit to Vietnam. You'll see some wonderful scenery from the train between Hanoi and Saigon. The most scenic section of line is along the coast where you can see bays and islands and through the hills. Around 1000 VND Daily since 2nd Feb 2007, ticket fare policy applied for train starting from Hanoi Station sometimes. You go from HCMC to PP via a daily bus or riverboat. It's a total of 500-600km depending which mode of travel you take and will cost you $25-$40 roughly for the whole trip. There are currently NO trains on the Phnom Penh - Kampot - Sihanoukville route or on the Battambang-Sisophon route. There has been talk for years of rebuilding the railway to the Thai border, and building a new line to Saigon, thus linking Europe and Singapore by rail without a gap, but no action has yet been taken. Two different lines. 3rd class only and travels to Pattaya, Chonburi, Aranyapratet (Cambodia border). These are slow trains and no pre-booking is possible, but the train takes 5 1/4 hours and is only 48BHT (approx 70p) and it connects with the skytrain in Bangkok at Phaya Thai. It's a 10 hours train ride for US$71.20 on a 2nd class Air Con sleeper. The train runs along the east side of peninsula Thailand. Connections to Koh Samui, Koh Phangan Krabi and Phuket are served by combo tickets which include bus and boat transfers. The train changes compartments at Had Yai and the 1st class carriages are removed. This is next door city, and for US$ 20 you can cross the border and arrive downtown Singapore. To my calculation it is coming down to around US$1500, but the real question is how would you need to take that trip? I like my rain like a Double - Latte with cream, but in Singapore it’s more than a espresso with no sugar, no milk, in your face. The question you ask yourself in the morning when you look up at the blue sky, is not if it’s going to rain today, but rather at what time it’s going to rain today. Last morning I was using intensely my laptop, focusing on what I should write next and I did not notice that within 10 minutes the bleu sky turned pitch black, and thunderstorms were lighting up the entire apartment. I took 2 pictures, during and after, within 20 minutes difference, and you can judge by yourself. The room became totally dark, I had to switch on the light. The next door hotel had its trees falling on the road and, rain & wind were so heavy that I thought it was a tropical hurricane. After being totally showered, the city drained the extra water out within few minutes and the sun came back like nothing happen. Hot and humide again. I am starting to understand the way the rain is in Singapore, except that I am not too good at deciding when to take the umbrella. I got soak too many times walking back to the apartment barefoot, totally washed. 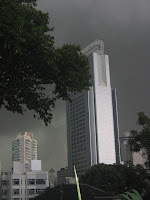 UOB Plaza is a complex composed by two towers, namely UOB Plaza One and UOB Plaza Two. The tallest tower, UOB Plaza One, is a 280-metre tall building with 66 floors, and was completed in 1992. 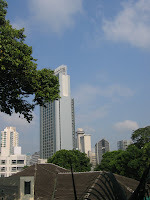 It is the headquarters of the United Overseas Bank, so its name UOB. Between the 2 towers, the main plaza hosts two sculptures on the ground floor, one in the "city room" which is designed by Salvador Dalí representing an Open heart and an Open mind. The other sculpture outside the main plaza represents a bird, designed by Fernando Botero. In the Columbian mythology this bird is the symbol of peace and was erected after the famous September 11, 2001 at the one of the 3 tallest towers in Singapore. The 2 others are UOB Plaza One (80 Raffles Place) and OUB Centre (1 Raffles Place), Republic Plaza (9 Raffles Place), both at 280 meters high. When you get off the Raffle MRT subway station, the first thing you notice is the giant atrium of the place and the view on the river. On the other side one can distinguishes the famous IndoChine Waterfront restaurant, which shares the stately Empress Place Building with the Asian Civilisations Museum. 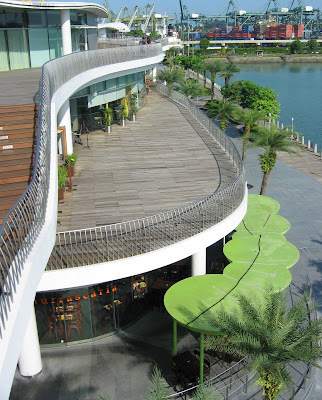 When you look on the right of the plaza, after the dome bar where all the banking white collar ambiance has its brunch at 11 AM, you can pick at Clarke Quay, another place where you can wander around the river, a place to eat, see, drink or been seen. When you look on the left of the plaza, after the “fat feet bird” you can have a pick at the Marina Bay and its Opera House (the Durian). 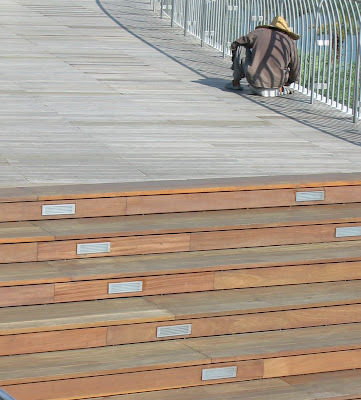 I can not imagine in 10 years when the entire Marina will be finish and I will be able to go around the Bay by foot, walking with a night the breeze for companion. Next door, the Fullerton Hotel, is the there to illustrate the fast growing of the British excellence during the colonial time and prove that Singapore was once a place where people enjoyed staying more than a week. I guess UOB Plaza, is the One Place to start a walking trip at Singapore, and maybe finish it as well. Nice place to stay and waste your time. In the urban jungle, The Lion is dancing tonight. The other day, I was visiting the Singapore 1:1 Island exhibition, on the urban future of Singapore, with some very exiting projects done, interesting projects in the doing and surprising projects in a close future to do (Marina Bay), when a very loud music was coming from the nearby Maxwell Food center. A yellow monster was dancing in front of a small red smoking temple. When I heard cymbals, drums and see some sort of big head moving around, I though it was the Dragon Dance, but after some research I found out that actually it was the Lion dance. The Lion dance originated in China almost a thousand years ago, and could be categorized into two styles, the Northern style and Southern style. The Northern dance was used as entertainment for the imperial court and is now mainly performed as entertainment (walking on a ball) for larger audience in circus, rather than the Southern dance is more symbolic. The latest is usually performed as a ceremony to exorcise evil spirits, to summon luck and fortune, and symbolizes the myth of the Chinese New Year. Usually in pair, or within family Lion dance is a spectacle that no one will miss in the Chinese community. During the dance performance, the two yellow Lions stopped in front of the small Buddhist temple and lied down for at least 5 minutes, giving from time to time mandarin‘s skin to close old men, a calendar and eventually through to the public some salad with its mouth, while some people on the side started to burn a lot of gift paper. During the Chinese New Year, Lion visit the local business store to pick the greens ("choi chang"). Business people would want to have good luck tie a red envelope filled with money to a head of lettuce and hang it high above the front door. The lion approaches the lettuce, consume the lettuce and spit out the leaves but not the money. At the end of the show, the 2 Lions unrevealed a drawing made of mandarins and pineapple. The lion dance is supposed to bring good luck and fortune to the business and the dancers receive the money as reward. The tradition becomes a mutual transaction. Chinese New Year started already and will last for at least one more month. In 2006, 9.7 million of tourists visited Singapore and spent an estimated S$12.4 billion (which is an average of S$ 1278.35 per tourist, or US$ 893.34 per tourist, or € 608.25 per tourist). To shop a lot in a humid and hot country, you’d better build big large and AC mall. VivoCity is the latest and most unique place to let your consumer maniac inside yourself behave. During its first month of opening (Dec 2006) the mall attracted 4.2 million visitors, which is the equivalent to the population of Singapore. 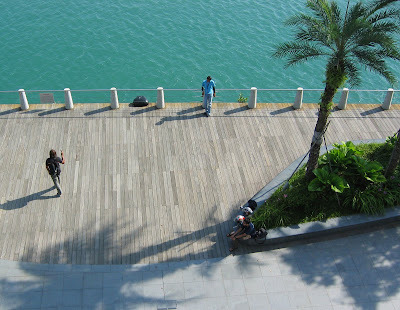 VivoCity is located at the HarbourFront Centre at the south tip of the island, in front of the Sentosa Island. VivoCity with its 1.5 million square feet of gross floor area and 1.1 million square feet of retail space is the largest shopping mall in town, a permanent place for sales and shopping galore. It was designed by the renowned Japanese architect Toyo Ito, cost S$417 million and was launched Dec 1st, 2006. What is interesting in this shopping mall is its uneven, asymmetric, bubble shape and new idea that welcome you in a new village within its space. The 300 m long promenade, the shallow roof pool, the large roof top amphitheatre, the various playgrounds and the open spaces in the mall are also popular places with families and children alike in the mall to stay longer and therefore spend more cash. Beside all the classic shopping mall you can imagine, few giant groceries malls, and load of parking palces VivoCity has Singapore's largest cinema multiplex with 15 screens and 2,293 seats by the cinematic company Golden Village. The experience at the Gold Class option, where you can have 180º leather seat with a warm blanket for your own pleasure while watching (sleeping) the movie, is just unique. There are two giant food courts — a 2,200 square metres in Basement 2, called the Kopitiam, and another spread over 2,500 square metres called Food Republic food court in similar concept at its sister food court at Wisma Atria. The main difference between the one that I practice on regular basis on Orchard road called Wisma Atria and VivoCity is the Carrot Cake and Laksa food stall. These two specialties are simply worth the cheap MRT trip after a blanket 180º leather seat movie. What else to ask in this consumer paradise? Maybe just to wish the Australian agency Woodhead good luck in its challenge to improve the signs at the VivoCity mall. Another reason people stay so long is because they get lost all the time. Geylang is one of the 5 or 6 DRAs (Designated Red-light Area) in Singapore, probably the most internationally known second after Orchard Towers. But the only Red thing I saw there was the dragon fruit at the corner shop in the main Geylang Road. Ok, you do have some very large houses in which tainted windows are the norms. But I guess it’s because people from there do not want to be bother by the sun during the day. OK you do have a lot of cheap hotel in the back alleys. But I guess it’s because the area is very well know among travelers and immigrants who can not afford an expensive “home”, even so on hourly basis. OK you do have a lot of manual activities in the back alleys. But I guess it’s because the manufacturing automation re-engineering process did not reach yet this away from the center road. OK you do have a lot of spiritual places with many redemption signs on the front door. But I guess it’s because people from there are more spiritual and a bit more focus on the end of the world that the rest of us. OK you do have a lot of local cheap and very good restaurants open 24-7. But I guess it’s because people from there are very appreciative about good food and want to be able to eat at anytime of the day or night. OK you do have a lot of men playing with their fingers. But I guess it’s because people from there are very into Chinese Chess and old men want to play all the time. I guess I have to visit Geylang during the night …because during the day time Geylang is one of the 5 or 6 DDAs (Designated Dead district Area) in Singapore. Chinatown in Singapore is small, tiny and full of … tourists. The area between Pagoda Street and Smith Street has been considered as a ChinaLand for tourists, with all its clichés and resizable shops and markets. Everything seems to be perfectly normalized and without smells or authenticity. But as soon as you move away one street from the delimited zone magic happens. Strange shops propose strange items. Like for example, this food stall that not only propose dry sausages in a wall of 4 meters high, but right in the middle of it you can contemplate flat, deboned, smoked ducks. Contrary to what you can observe outside the ChinaLand for tourists, houses are very much well polished and well structured. Everything fit together in an elegant way. Almost if the picturesque 4 streets proposed to tourists should reflect what was anticipated. During this rainy exploration day, people in Singapore take it as it should be when rain pours down on you. They wait and watch, discuss or eat while the rain keeps cleaning the city. Chess board is a serious business and I am sure that Tuk-Tuk drivers who recycle as a Chess champion had to pass a Chinese Chess test before having their Tuk-Tuk driving license. The Buddha Tooth Relic Temple (288 South Bridge Rd) is a massive red building on the edge of Chinatown. This four-story temple was just finished few months ago. A few meters away from it, Sri Mariamman Temple (244 South Bridge Rd) is Singapore's oldest and most important Hindu temple. People line up their shoes outside before entering the plain temple. This is quite a contrast with the Buddha Temple that is more impressive and spectacular by its size. The temple hosts a 27-foot statue of Maitreya Buddha, and the sacred relic itself, reputedly one of Buddha Shakyamuni's teeth, can be found on the fourth floor. On the roof is the 10,000 Buddhas Pagoda, hosting a large Tibetan-style prayer wheel. I haven’t counted each of them but it seems quite a lot. Each wall is filled with some urn coffin and a number that people visit to cherish until the closure of the temple. Contrary to the scenery, Chinatown in Singapore offers the best food option one can imagine. In a small radius you can find the best and finest food courts in the region filled with hundreds of hawker center stalls. Maxwell Food Center (2 Murray St., opens for 24 hours) and Smith St. Food Center are only two to be mentioned for now. I promise to have a detailed and dedicated entry on each Hawker Center later on. When lights turn red in Chinatown, Smith St. changes itself into a giant street restaurant where people gather around a S$ 5 Tiger beer, or a massive plate of Carrot Cake. This is probably the best way to enjoy ChinaLand, at night with some food and friends in a street restaurant. 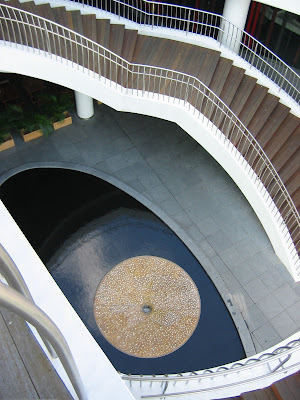 Otherwise it would be better to sneak to Ann Siang Hill instead for a drink, a movie or ballad in the garden. The same way you have many India(s) in India, you have many India(s) in Little India. Let me explain, you have many different part of India even in the Little India around the world, yet you can expect to see the same thing over and over again. In every Little India, you will be able to find the jewelry shop with the protected bar between you and the merchandized. You will still be able to find terraces where you can seat down all day long and drink Massala Chai while talking with your friends rebuilding the world over and over again. You can even find Sari shops where you eyes will hurt attacked by so many colors dress and scarf that you will have to close them for a while before moving back to your exploration. You will eventually find a street shop in a back alley, where the line up is so huge that you have to stop and ask why people waiting in line. You might face an awkward smile and a head shaking urging you to take your turn in the line for a fantastic Dosa or Butter Chicken. But you have in each Little India a small a slide different taste that you don’t have in the other one you can find in the world, even mother land. In Singapore you can find in some places some Chinese signs slowly being replaced with Tamil, Hindi, Bengali and other more exotic Indian scripts. Houses in Little India in Singapore are almost all the time colonial style, two storeys high with 2 wooden windows symmetrical to the entrance door. Then at the end of the block, you have the biggest mall of all, Mustafa Center, Open 24 hours, where you can find whatever you want ranging from Rolex watches and washing machines to fresh mangoes, bags of lentils and tailored suits. In the middle of the place, the busiest street in the place to house hair cut shop that takes you back to the future of 1988. Only Tamil Latin dance competitor, Scandinavian soccer player or Singaporean skateboarder can appreciate the deepness and the range of the long-tail-but-no-pony-tail look you can get there. Within a block, temples, churches and other devotion places cover the main Serangoon Street and compete with other place of religion more modern I would add, namely Backpacker Hostels. The smell you can grasp on your journey has nothing to do with what you can expect from a (small or big) Little India. Flowers used to warships the Hindu gods and goddesses fulfill the streets with not only graceful colors but also with some amazing exotic smell. You can buy your flower necklace of bangle for your pray just before going to the temple, but also as I saw many times to garnish your home for the special event you throwing tonight. Everything changes when around 7 PM, people start going out to appreciate the cool and pleasant nascent night on their way back from work. Fruits and vegetables change colors and shape due to the over lighting that shops put together to attract mosquitoes and buyers. In the blue night of Singapore, the colorful Little India made me wonder what would be the Big India at night. I whish I could use this transportation machine I saw during the day in one of this scary shop in the Little India, to go to the real thing. Maybe one day I use a plane instead. More time though but less experimental. Eating stops along the way. Komala Vilas (76-78 Serangoon Road). A Singaporean institution featuring purely vegetarian Indian food. Downstairs is fast food, head up for restaurant-style seating and serving. Sets start at less than $2 and even the largest platter of breads and dips will cost less than $5. Saravana Bhavan (36 Belilios Lane). The Singapore branch of a restaurant chain from Chennai, serving up vegetarian Indian food. Cheap and fantastic Massala Chai. Banana Leaf Apolo (54-58 Race Course Rd) An institution for all sorts of South Indian food; no prizes for guessing what serves as the plate. You eat on a banala leaf, with your hand, a lot of food in your stomach. Tandoori Restaurant (166 Serangoon Road) has an excelent Chicken butter, and Cheese Nan. Sitara Restaurant (291 Serangoon Road) supposed to have the best sea food menu in the Little town. Same owner as Tandoori. Mentioned but not tasted. Azmi Restaurant (Junction of Serangoon Rd and Norris Rd) is a unique restuarant, very cheap and authentic where Chapati are still made the old way by old man and distributed on old table for old fashion customers, at an old price. Sri Kamala Villas (662 Buffalo Road) is reputed to have the best Dosai in town, not yet tasted, but soon to be. HaPpY NeW YeAr 2oo8 to YoU!